This book presents readers with the fascinating story of the history of psychoanalysis during the time of the British Mandate in Palestine and the early days of Israel’s statehood. During the 1920s and 1930s, and particularly with the rise of anti-Semitism in Central and Eastern Europe, the Nazi rise to power in Germany, and the invasion of Austria, disciples of Freud began arriving in Palestine and laying a foundation for the psychoanalytic movement in the country. They included Dorian Feigenbaum, Montague David Eder, Max Eitingon, Moshe Wulff, Josef Friedjung, and Grete Obernik-Reiner. 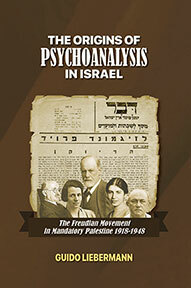 Freud’s theories would not have been accepted in the circles of the Jewish community were it not for the efforts of these followers of psychoanalysis, who worked with enthusiasm and determination to introduce Freudian methods into hospitals, educational institutions, social services, the Hebrew University, and kibbutzim, in particular the kibbutzim of HaShomer HaTza’ir. Guido Liebermann paints a colorful and lively portrait of figures such as Aryeh Feigenbaum, Siegfried van Vriesland, Henrietta Szold, David Idelsohn, Zvi Sohar, and Shmuel Golan, who called on the Jewish People to acknowledge its indebtedness to the Jewish genius from Vienna, the father of psychoanalysis, Sigmund Freud. Freud’s methods made it possible to provide attention and treatment to thousands of war orphans, Holocaust survivors, kibbutz children, and children of immigrants from Arab countries. Guido Liebermann is a psychoanalyst and member of the Freudian Psychoanalytic Society (Paris), a historian and member of the International Society for the History of Psychiatry and Psychoanalysis, a senior clinical psychologist in a state psychiatric hospital in central Israel, and the author of many articles and two books: La psychanalyse en Palestine 1918-1948. Aux origines du mouvement analytique israélien, CampagnePremière/, 2012 (published in Spanish and Hebrew; Portuguese edition forthcoming), and La psychanalyse à l’épreuve du kibboutz, CampagnePremière/, 2014 (published in Spanish and Hebrew as well).